On March 24th, ACOM presented the 11th session in the series "What was it like growing up Armenian in ....". The panelisyts for this session were; Darla Kashian (Milwaukee,WI), Marty Meketarian (Cleveland, OH) and Margarita Aroutiunian (Yerevan,Armenia). A capsule report of the session will be coming soon, stay tuned. ACOM's annual Gaghant Party was again held at Midpointe Event Center - on Friday January 11, 2019. Over 100 people were registered and provided with dinner catered by Mim's Restaurant, a Silent Auction, a Kids Game room, and dancing to Music Mundial. was held at Keljik's Oriental Rug Store this year. 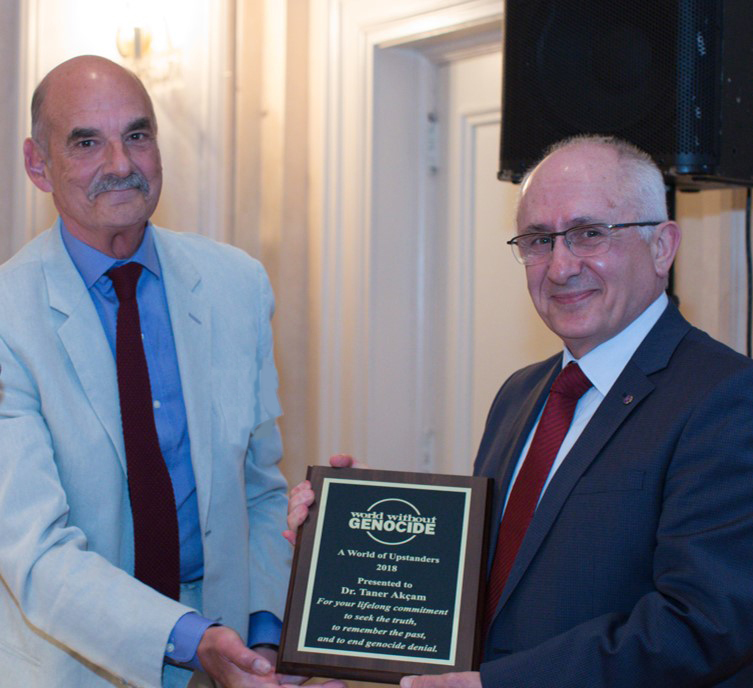 The featured presenter was Dr. Charles Hajinian who gave a presentation on Urartian and Pre-Urartian Antiquities. ACOM Cinema Saturday in August featured parts 3 and 4 of the Russian produced TV comedy - My Big Armenian Wedding. Tigran, a popular plastic surgeon in Moscow with roots in Armenia, and Lena, a well-educated and beautiful Russian woman, are in love. Families on both sides are mostly against the prospect of a "mixed marriage" and therefore devise various schemes to derail the impending engagement. Absurd and delightful situations develop. Comments on the series were, in general, positive. Although it was a bit over-the-top in some aspects, the filming taking place in Armenia was particularily interesting. Many familiar sights were presented. The major characters portrayed for the Armenian family were said to be quite accurate especially the Grandmother. The series got off to a slow start but as the plot developed it became more interesting and funny. Since the production was Russian, the dialog was mostly in Russian with some Armenian thrown in. The series was subtitled in English for those of us who are not conversant with either Armenian or Russian. Thanks to Natasha Vaubel for her knowledge and diligence in rounding up these Armenian films. The annual ACOM Summer Picnic was held this year at Como Park in St. Paul. We had reserved the West Picnic Shelter for this event. This is a new location for us but provided lots of opportunities for the attendees. The Shelter was near the Como Mini-Golf course, just across the street from Como Town (rides for kids). A short walk took people to the Cafesjian Carousel, Marjorie McNeely Conservatory and the Como Zoo. There was a kids' play area near the shelter also. The picnic started at 3:30 pm on Sunday afternoon, July 29, 2018. There was a grill nearby and many people brought their own meat to grill. The weather was extremely accommodating, even though there was a slight chance of rain (which didn't happen!!). 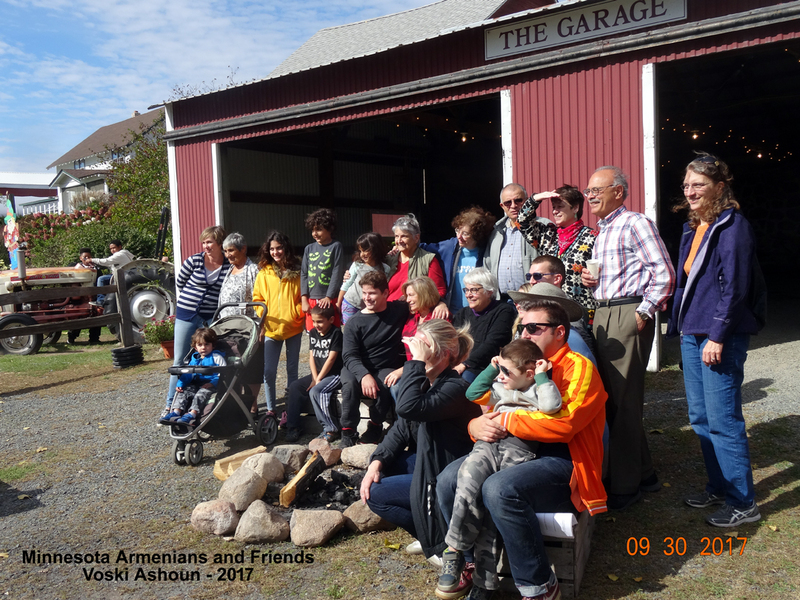 More than 50 Armenians and their families and friends joined us for the afternoon with food, music, conversation, fellowship, games and simply a marvelous time for all. Comments we heard about the venue were very positive and people would like to return to the same location next year. recipient of the Alice Musabende Outstanding Citizen Award. 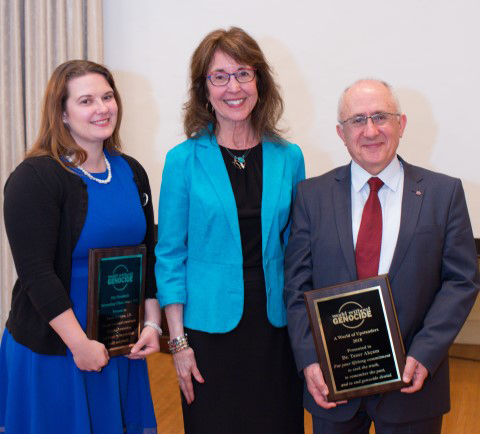 Chair of the Board of Directors Jack Rendler (left) presenting the award to Dr. Akçam (right). The 2018 Festival of Nations held in St. Paul at the beginning of May is now history. The Festival has been running since 1932 and the Armenians were one of the twenty nationalities represented from the beginning. the Festival of Nations has inspired people throughout the region to discover more about our world and embrace the rich cultural diversity brought to us by immigrants from around the globe. ACOM Held a Talk on April 24th 2018 commemorating the Armenian Genocide of 1915. "Why did it happen? What were the events leading up to the Genocide". The event was held in the auditorium of the St. Anthony Park Library in St. Paul. The event was well attended (43 at one count). Before the start of the event, Buttons calling for a remembrance of the Genocide were passed out to attendees. Tom also gave selected members of the audience colored cards with various pieces of information about times, places, and actions of historical significance leading up to the time of the Genocide. He used these during his talk, further involving the audience in the presentation. An audio recording is currently available for the presentation. The talk was a bit under 1 hour in length. Click on the link below to hear the audio. ACOM Cinema Saturday was held in the home of Terry and Nairy. Starting at 6:30 PM with a Social "Half-Hour" the 13 attendees viewed the Movie "You don't know Jack". 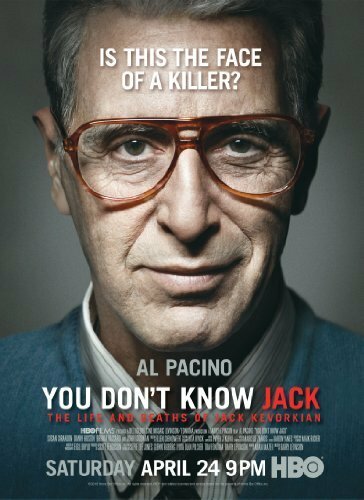 The movie was about Dr. Jack Kevorkian and starred Al Pacino as Jack, Brenda Vacarro as Jack's sister Margo, and Susan Sarrandon as Janet the Hemlock society's president. Thirteen of us viewed the movie and then Aram led the group in a spirited discussion of the movie. Snacks and beverages were provide pot-luck style. Everyone had a pleasant and stimulating evening. ACOM's annual Gaghant Party was held at a new venue - Midpointe Event Center - on Friday January 12, 2018. Over 100 people were registered and provided with dinner catered by Mim's Restaurant, a Silent Auction, a Kids Game room (new this year), and dancing to Music Mundial. The new event space was spectacluar with lots of room, separate areas for auction and games, wonderful decorations and special lighting effects on the windows with the Armenian Flag Colors. Dancing then followed with Armenian Music by Music Mundial. We did get a lot of people up to dance, especially the younger generation. All-in-all a magical evening with very special people in a fabulous setting. A wonderful way to end 2017 and start the new year of 2018 - our 38th year. Hooray!!! ACOM's annual Voski Ashoun Celebration was held this year at the Pine Tree Apple Orchard in White Bear Lake. The day was a perfect autumn day for an excursion and picnic at an apple orchard. About 30 people attended and shared food, stories, a trivia game and wandering around the orchard and visiting the gift and bake shop. Peter Hajinian formulated an Armenian trivia quiz that most of the attendees perticipated in. There seemed to be no clear winner, even after a number of run-off questions all correctly answered by the 5 finalists. Peter finally announced that the first prize would go to "Poly" for a question that Poly asked of the trivia master that he couldn't answer. Everyone in attendence enjoyed the outing. Armenians were again represented at the International Institute of Minnesota's Festival of Nation celebration. This Festival has been ongoing since 1932 and Minnesota Armenians have participated in the Festival since its start. During the Festival every year, there is a Flag ceremony held each day. This ceremony celebrates the varied ethnicities of Minnesota (particularly the Twin Cities) and the current bond that brings them all together - The United States Flag. This year Bradley Erickson and Reena Ghanoum participated, representing Armenia. The ceremony is quite moving and shows us that we are a united people under this flag.